Avantree Lock is a plug & play Bluetooth audio adapter set. As long as you have audio source device, such as TV, MP3, PC, etc, and an ordinary wired headphones or speaker, you can enjoy movie / music wirelessly. This set helps you out of annoying pairing steps. Power, connect and play - 3 steps achieve wireless entertainment. It is a pre-paired set. It can be used separately, but not recommended. If you are skillful, you can try it on. If not. Just enjoy it plug & play. Mobile phones, Tablets, PCs, MP3, CD player, TV, Speaker, Home Stereo etc. BLUETOOTH AUDIO ADAPTER SET: Enjoy watching your favorite tv shows or movies wherever you are in your home, or host a party with an awesome speaker system with this adapter set. How does it work? While the TX unit enables TV, PC, AVR or other audio source into a Bluetooth device, the RX unit turns your wire headphones or non-Bluetooth speaker into wireless one. Clever! VERY EASY TO USE & NO LIP-SYNC DELAY: If you're not exactly tech savvy, worry not! This is a truly plug-and-play device, with no pairing needed. Simply power on the TX and RX unit, and they will reconnect to each other automatically. Both the transmitter and receiver units support aptX Low Latency, you can enjoy TV wirelessly without sync delay. IDEAL FOR VIDEO RECORDING: Simply plug the the transmitter to your digital video camcorder, plug the receiver to your microphone, you will be able to make the video recording with no lip sync delay between image and sound. BLUETOOTH REPEATER BOOSTER: You can also use this set to extend the working range of your existing Bluetooth devices. 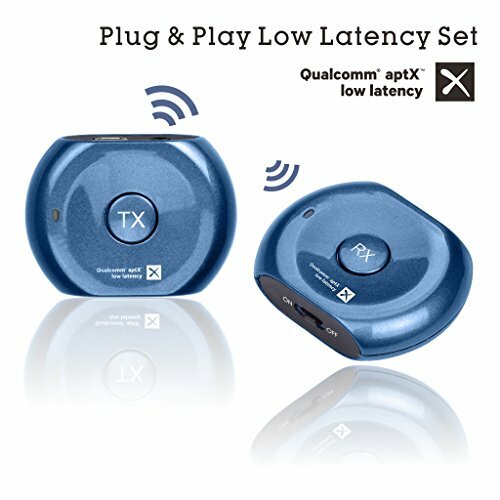 Connect smart phone / PC (with built-in Bluetooth) or other audio source to RX unit, TX unit to Bluetooth headphones or speaker, 3.5mm cable connecting TX and RX units. You can hear sound from PC at most corners of your house. AC POWER & BATTERY 2-IN-1: Whether you're outdoors or indoors, this Bluetooth transmitter and receiver is perfect. While indoors, the built-in battery protection means that you can connect TX to a USB charger ongoing power. And while outdoors, you can use it for around 6 hours with a fully charged battery.